Register several time zones, and watch themata glance. 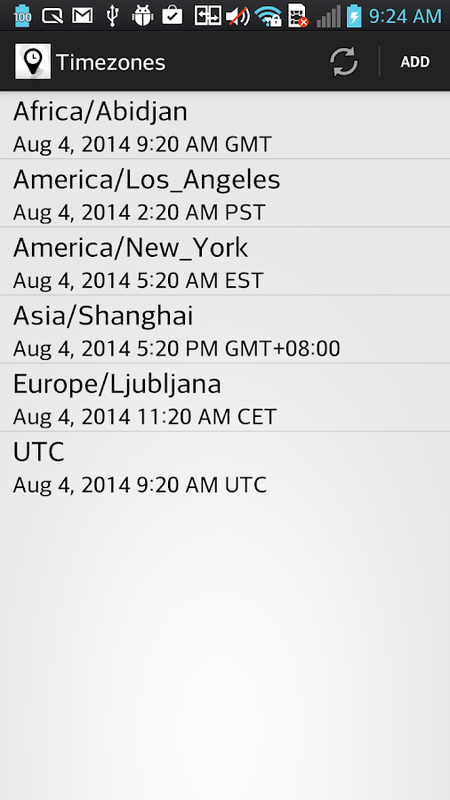 You can check current time of each time zone. If you change time of any time zone, other time zones arealsochanged together. Register several time zones, and watch themata glance.You can check current time of each time zone.If you change time of any time zone, other time zones arealsochanged together. Logbook Pro is the most reliable, trusted, and accurate flightlogbook software for pilots used in the aviation community for over19 years. Logbook Pro enables you to log your Certificates,Ratings, Medicals, Flight Reviews, Historical data, and Flights(actual or sim) and view detailed and extensive reports. Importairline schedules and integrate with your device's calendar forreminder notifications and scheduling deconfliction.Features: *Efficient user interface with easy to read color scheme * LogCertificates, Ratings, History Items (Medicals, Flight Reviews,etc.) * Auto Night in Flight Log Entries and also ScheduleImporting* Log actual and sim flights * View when expiring events(History Items) expire instantly on your device * Calculateduration from OUT-IN or TAKEOFF-LAND times with the tap of a button* View powerful and comprehensive reports generated by Logbook ProPC edition right on your device * Show currency status with coloredmarker flags indicating current or expired * View your detailssummary bar report * Analyze complete logbook statistics with bothtotals and percentages * View FAR 121 limitations with coloredmarkers (requires Logbook Pro Professional Edition or higher) *View FAR 135 limitations with colored markers (requires Logbook ProProfessional Edition or higher) * Auto-enter the duration value inother time fields with a single tap * Customizable cascading timeentries for Out, Takeoff, Landing, and In making flight entry quickand easy * New flight entries can default with prior flight entrydata for rapid flight log entry * Customize the layout to declutterdisplay showing only fields you need * Simple synchronization *Device uses colors to identify current and overdue, synchronized ornot. No need to purge, the device manages your data smartly *Instant filter in each data area to show: All Data, Not YetSynchronized, Synchronized* Free-form route entry allows a singleentry for the entire day; no hassle with picking or searching forairports. * AutoFill makes populating common time fields a breeze *Log multiple approaches of each type for each flight * Log "By Leg"or "By Day" allowing you to collate your entire day into a singleflight log entry * Import Airline Schedules from directly withinthe app* Integrate with your device's calendar and sync with yourother calendars * Password protect your app from unwanted access *App Time Zone and Sync Time Zone support for Local, UTC, or acustom selected "domicile" time zone. * Check weather quickly onmultiple destinations (METAR and TAF) * Quick increment buttons toeasily add/subtract values for fields such as landings, approaches,etc. * Auto-enter airport identifier in route field with tap of abutton * Get overhead view of airfields using Sky View* Extremelycustomizable with a plethora of options to make the app into whatyou need Resources: ✦ Setup Guide:http://nc-software.com/android/setup✦ Documentation:http://nc-software.com/docs/android ✦ Cloud Sync Info:http://nc-software.com/docs/sync Notes & Requirements: ✦ Thisapp is not a stand-alone logbook, it is designed to work in tandemwith Logbook Pro Desktop✦ Synchronization with Logbook Pro Desktoprequires cloud sync. For details see http://nc-software.com/mobile✦ To enable schedule importer features visithttp://nc-software.com/siLogbook Pro is a registered trademark ofNC Software, Inc.